Going to cover a lot of things here. This is absolute bottom dollar sorts of things, so if you don't like things like hostels, there are still cheap hotels, and if you watch, there are some that are even cheaper than the hostel route. Fare watchers are a lifesaver, as well as alerts. There are a few, they're pretty much the same. While there's a lot of advice out there as to how early to book, I have not seen anything that holds up all the time and each route is different. Generally speaking, major airports and major airlines go back and forth on price. There are now a few ultra budget airlines popping up with service to various parts of Europe. Norwegian Airlines is starting a bunch of transatlantic routes to various places in North America. What I like is booking on miles. Miles credit cards are so numerous and there are so many good perks. I pay household bills, my recurring stuff, like gas and electric with a miles card. It requires some financial discipline so that you pay off the card monthly and don't end up going down a credit spiral. There are some point maximizing strategies you can employ as well. Meeting friends for dinner? Offer to put the whole check on your card, but then have them pay you cash to cover it. You are then getting points for the money they spend. If you have a business, putting vendor bills on a miles card should be a no-brainer. First, the finance of it, usually you get 30 days on an invoice, so you pay on a card towards the end of the payment terms, whatever they are, then, your card payment is usually not due for another 30 days, give or take. So this extends how long you can have an item and potentially sell it before you have to pay for it. Depending on how fast you turn over your stock, you can pick up one or even more inventory cycles by doing this. I'm not going to get into which card is best, because it depends on what you want, I will just say do some homework on what cards give you what. I like the ones that are branded by the airline. They tend to give you perks beyond just miles, like free checked bags, priority boarding, and higher mile status, like Delta's medallion status. They may not give as many points as others, and they usually have an annual fee, so weigh that against other perks other cards give you. One thing to remember, many of the airline miles programs have bad blackout dates and, as I learned last time I booked to Europe on American, you can get a killer deal to Europe, but coming back, they don't do nearly as well. I got a deal to Vienna for 63,500 miles for first class. Coming back, I was really limited in choices and ended up flying out of De Gaulle in Paris for 68,000 miles for coach. There are a lot of tricks, like go into a smaller airport, but this can have the drawback that transportation is either non existent or more expensive. So make sure you balance that out. Airports, in most cities, are located well away from the city centers, so it can be very expensive to get a transfer to where you are staying. Check the price of the airport transfer before you book a flight. When it comes to booking a flight with miles, keep in mind most of the airlines change the redemption rates and availability of routes at least daily. If the flight you want is blacked out, try again the next day. Also check out first/business class. sometimes they have super deals that make it cheaper than a regular coach class fare and it's awesome. On a long flight, a lay flat bed seat is one of the greatest things ever. Hostels are about the cheapest option, usually. There are some drawbacks. First, you often need to bring your own sheets/bedding. If you're doing a backpack across Europe trip, you really should have like a sleeping bag or something, so usually not a big issue for that sort of thing. You can get sheets for pretty cheap at Walmart before you go, so just keep this in mind. Most hostels have the super cheap dorm style rooms and for more money, private rooms. Even with the private rooms, you usually still have to share bathroom facilities. The nice thing with hostels, especially if you're traveling by yourself, they are great places to meet people. I've met some really fun people who I've shared a dorm room with. Common rooms are usually fun too, and a lot have things like bars with drink specials and other type get-togethers. Sometimes though, for what you pay for a hostel, especially if you're traveling with more than yourself, there are better options. I prefer having my own bathroom. The Ibis chain is a European discount brand, about like a Holiday Inn here in the States. They tend to be nice, but not high on the frills. A lot of the rooms are tiny, so keep that in mind. I don't need more than a clean room, a nice bed, and a clean shower. There are also some of the American chains, like Best Western there, and in US Dollars, they are generally about the same price as what you'd expect here. This is an area where you can either make or break your budget. By far, just like at home, the cheapest way to eat is to go to a grocery store. In Europe, it's funny how much is similar and how much is different. Eggs are not refrigerated. Milk isn't either and comes in boxes. They don't really have wonder bread. Flour is still flour, but often they have multiple grinds instead of the fine ground wheat we have in the US. Of course, everything is measured in metric, so kilograms, grams, decagrams (10 grams, a common unit for meat). I love the cultural experience of going to the grocery store in another country. Peanut butter doesn't really exist, but nutella does and if you've never had it, it's awesome. A lot of hotels will serve breakfast, usually buffet style. Do not take anything out of the dining room, like rolls or nutella, or anything. They regard this as theft. Most of the breakfast items are recognizable, some are a little different. Pray they have Irish bacon, because wow. Instead of the pork belly that's full of fat, they cure the pork loin, so it tastes like what you're used to be it's a way better piece of meat. A continental breakfast is called that because it's from Continental Europe, so don't be surprised if breakfast is just coffee and a pasty. Their pastries are better anyway. That's one thing to mention. Don't miss the bakeries. In France, they're two types, the boulangerie, that specializes in breads, rolls, and similar items (don't miss out on a good baguette) and a patisserie that specializes in pastries and sweets. I will often go to a boulangerie and get a baguette and then to a grocery store and get some meat or cheese to go with it. I can rarely finish a full baguette myself, but usually need a little protein with it. In Vienna, make sure you try a traditional coffee shop. They serve your coffee with a slice of cake or other pastry. All of them are truly astounding and aside from the really touristy ones, reasonably priced. I love street food. There are stands for literally anything. I will do a post in the future about some of my favorites, but there are so many options and some are very regional. Due to the large number of Muslim immigrants, there are a lot of halal stands around. The Doner kebab is widespread and pretty good. You can usually find one for about 5 Euros or so. I've also found falafels and other things. In the Netherlands, pickled herrings are common. I quite like them, but they aren't for everyone. 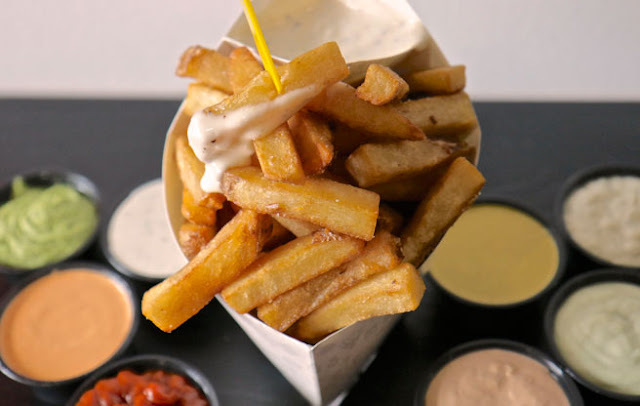 French fries, especially in Belgium are a must have. Many of the breweries have their own attached restaurants, usually with excellent local favorites. Some can be expensive, but most aren't bad. Their beer tends to be reasonably priced too. Bars can have some of the best food, especially in England. English pub grub is one of the few truly English meals that are good. Of course, in England, curry is everywhere and can be inexpensive. Biergartens in Germany are a fun cultural experience, and can have a broad range in prices. Also, look up local tipping customs before you go. In some places, tipping is considered rude. I will divide these into two categories-typical tourist stuff and specialized items from that country. With your typical tourist stuff, postcards, t shirts, shotglasses, magnets, hats, and other stuff you see in every tourist shop everywhere on earth, the closer to the tourist areas you get, the better prices you can find, especially if you shop around a bit. Haggling is usually not only allowed but encouraged. Keep this in mind, because a lot of the shop keepers will quote a first price as much as double what they're really willing to sell the item to you. If they don't want to haggle, they'll tell you and that's ok too. As far as things that are more specialized, if you can get away from tourist areas, you can usually find a better price. A prime example is Bohemian lead crystal glassware in the Czech Republic. If you're in the middle of Prague, prices are almost double or more what they are outside the tourist core of the city. If you can get out of the city, you can find it for even cheaper. The best price I found was direct from the factory in Svitavy, but that's well away from Prague and probably will not be an option for most travelers. With souvenirs, remember, if you buy it, you have to pack it around with you. Also, when you come home, you are allowed up to $800 in merchandise duty free. Don't try to hide items, if they find it when you clear customs, they can confiscate the item and/or fine you. A lot of places will offer shipping. If you ship items, you may have to pay customs duty on them when they arrive, or to ship them in the first place, but they do not count against your limit. Plus, you don't have to figure out how to haul that stuff back. It can get expensive. One other thing to remember is the European Union Value Added Tax (VAT). It's a sales tax added to everything and ranges from 15-25% on all items. If your purchase meets a certain threshold, which is different by country, you can have this refunded to you when you leave. The retailer will provide you paperwork, but you must have your passport present when you make the purchase. This usually only applies to a single purchase at a single retailer in order to get the paperwork you need, but any purchases you make over the threshold, you can get the voucher and turn all of them in when you leave. This is added to the price before you purchase something, unlike American sales tax that is added after, so the price that's marked is the price you pay, and it includes the VAT. When you depart, there is a kiosk at major airports, ports, and border crossings outside the EU. Take your paperwork there and they will give you a refund. I usually don't make big ticket purchases, so I rarely qualify for the refund.